WHAT DOES OUR SOUND BAR DO FOR YOU? You don’t need to appease yourself with the built-in speakers of your TV now and you get to enjoy high-quality audio without the cost or hassles of a surround sound system. 1.This Soundbar will automatically enter Sleep Mode when it has stopped working for an hour, so please press any button or rotate the switcher to wake it. 2.With the low power protection, if the device works under 3.3V or below for more than 15 seconds, it will shut down automatically for safety. 3.For those devices without Bluetooth function, you can connect your device to the soundbar by a 3.5mm audio cable (included). And it only supports 3.5mm audio cable, please make sure that your TV is supported. When the LED light is off, it might be power off and you need to charge it before you use it. Best Way To Boost Your TV Audio: Built with dual powerful soundbar speakers and unique anti-noise technology, our powerful sound bar lets you enjoy full-range stereo sound with impressive volume. Wireless / Wired Connection Modes: Our Surround Sound Bar supports three connection modes. Bluetooth Mode - Comes with a Bluetooth v4.1 technology which allows you to stream music or video from your mobile, smartphones, laptops and desktop computers up to a range of 10 meters with one-touch. Line in Mode - Connect the sound bar with the 3.5mm audio cable. TF mode: Supports inserting TF card to play music. [IMPORTANT NOTICE] This sound bar only supports Analog TV, not for SMART TV. Touch / Remote ControL: With dual operation mode, remote for play setting, volume adjustment, input and audio controls, ideal for home theater system and outdoor. 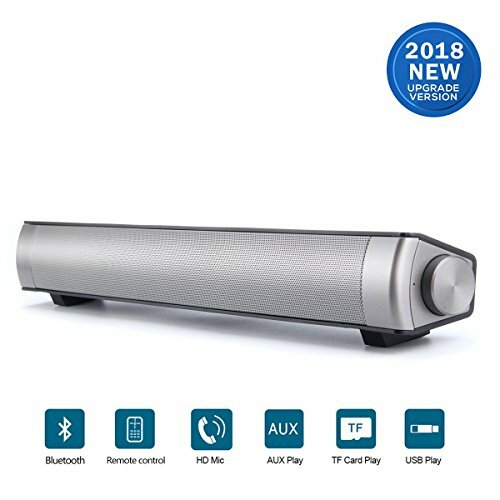 Unique Design: Our bluetooth sound bar has a 360°high-grade appearance with high quality material to last years. Built-in microphone for hands-free speaker phone calling. What You Get: TV Sound bar, Remote Controller, Optical Cable, RCA to 3.5mm Cable, User Manual and 24 months extended warranty. If you have any questions about this product by VOLOL SMLIFE, contact us by completing and submitting the form below. If you are looking for a specif part number, please include it with your message.